Whether you’ve been to San Luis Obispo dozens of times or you’re considering your first visit, this insider’s guide will help you plan your weekend trip from San Francisco. We have your trip covered with various routes to get to San Luis Obispo and how to enjoy every moment once you arrive. For a quick and easy-going travel experience, the San Luis Obispo County Regional Airport (SBP Airport) offers non-stop flights from San Francisco International Airport (SFO) to San Luis Obispo daily. United Express recently began to offer a third-round trip flight to San Francisco. You can easily coordinate ground transportation or rent a vehicle from a rental car company on site for a convenient ride to your hotel or destination of choice. If you are looking for an affordable and convenient mode of transportation, Greyhound offers a daily bus into San Luis Obispo County from San Francisco. Additionally, Amtrak California has three bus routes, starting in Oakland and San Jose. Partaking in a classic California road trip to the scenic Central Coast will be a trip you will never forget. Whether you are in a hurry to San Luis Obispo or taking your time to stop along the way, driving from the Bay Area to San Luis Obispo is a hassle-free experience along Highway 101. The Pacific Coast Highway (PCH) offers travelers an incredible scenic route as they tour the Central Coast from San Francisco to San Luis Obispo. The Amtrak Station in San Luis Obispo is served daily by the Coast Starlight train, traveling between Seattle and Los Angeles, making it easy to travel by train into San Luis Obispo. Enjoy a breathtaking journey with views of the majestic Pacific Ocean and rolling hillsides aboard the Coast Starlight train. With countless things to do, you will never find yourself bored while visiting San Luis Obispo. Famous for its serene coastlines, exquisite wineries, and remarkable landmarks such as Hearst Castle and Mission San Luis Obispo de Tolosa, SLO offers visitors a plethora of outdoor activities and leisurely outings in its rural countryside setting. Find activities to plan for morning, mid-day and night for an authentic, fun-filled SLO experience. Cafes: A morning stroll to a local coffee shop or café that radiates San Luis Obispo charm is a picture-perfect way to start your morning. Spas & Salons: Start your day feeling refreshed and recharged at a day spa, hotel spa, or salon. From luxurious spa services such as facials and massages to a soak in the natural hot springs, San Luis Obispo is the perfect getaway for a relaxing spa retreat. Beaches: Especially when coming from the Bay Area, a beach excursion is a must while visiting our laid-back town. Catch a wave at a local surf spot or enjoy a warm California day at one of the top beaches along the Central Coast. 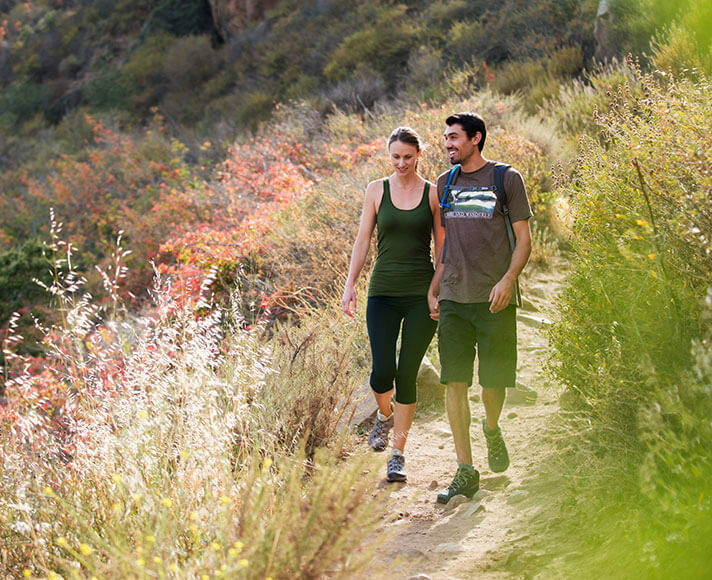 Hiking: One of the best ways to discover San Luis Obispo’s natural beauty is by foot. Check out the many trails that offer spectacular views from misty mountains to the rugged coastline. Shopping: If your idea of relaxation is some retail therapy, wander down to Higuera Street in Downtown SLO for a day of shopping at trendy boutiques, vintage shops, unique stores, and more. Restaurants: Nestled in the heart of the Central Coast, SLO is a foodie hub to be explored. Enjoy a memorable dining experience with a captivating atmosphere, fantastic service, and exceptional food at an enticing restaurant or café in San Luis Obispo. Avila Valley Barn: Avila Valley Barn offers an authentic farm experience for adults and children alike. Pick your own fruit and vegetables, browse an open-air market of locally-grown produce and unique country gifts, visit the petting zoo, or treat yourself to something sweet at the Sweet Shoppe. Hearst Castle: Plan a day trip to Hearst Castle with your family and friends for a guided tour of the historic landmark. Home to the famous newspaper magnate William Randolph Hearst, the grand estate features acres of beautiful gardens, the Neptune pool, and extravagant main house. Museums: The Mission San Luis Obispo de Tolosa located in downtown is the root of San Luis Obispo’s history and a must-see for history buffs. Experience the deep historic character of SLO through local museums and learn about the area’s rich, diverse past. Beer Tasting: Are you a beer enthusiast? If so, be sure to pencil in a beer tasting and visit San Luis Obispo’s wide variety of craft breweries. Wine Tasting: Edna Valley is home to award-winning wines, sprawling vineyards, and stunning views, which makes for an afternoon well-spent exploring San Luis Obispo’s wine country. Art Bar: Create your own masterpiece while sipping on a glass of Central Coast wine at The Station. Local artists guide you through creating the night’s featured painting or craft and the $40 ticket includes your first glass of wine and supplies for your painting. SLO Repertory Theatre: The SLO Repertory Theatre, a local favorite that has been around since 1946, is the perfect spot to enjoy San Luis Obispo’s performing arts through an afternoon matinee or a romantic evening at the theater. 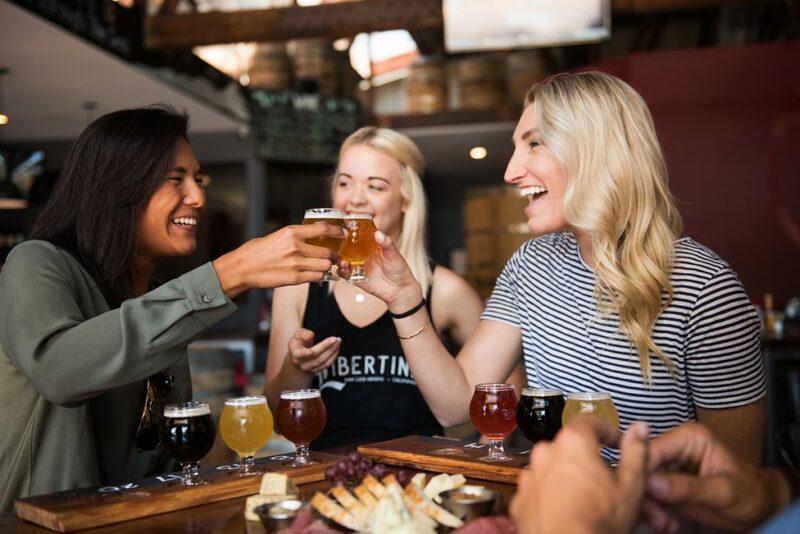 SLO Happy Hours: For a fun-filled afternoon or evening, choose from the plethora of restaurants and bars in San Luis Obispo with drink specials, happy hour food deals, and live music. Music: San Luis Obispo features music of every genre you can think of in a variety of venues, from an intimate cocktail lounge concert to a lively music festival by the beach. Downtown SLO Farmers’ Market: Every Thursday evening, Higuera Street in Downtown SLO closes off for its weekly Farmers’ Market. 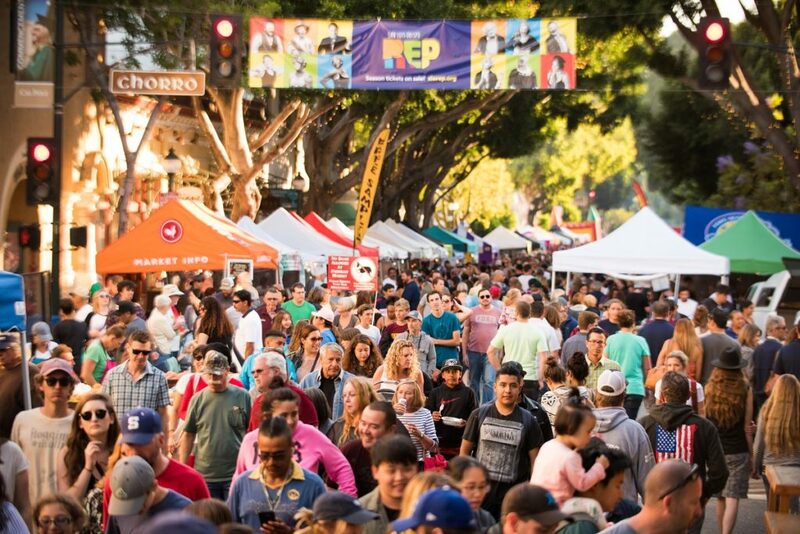 Known as one of America’s largest weekly street fairs, this market offers a cornucopia of farm-fresh produce, gourmet food, live entertainment, and more. Nightlife: Explore SLO’s bustling nightlife scene at one of the many bars, taprooms, or lounges located down Higuera and its side streets. Visitors are bound to have a great time, from experimenting with specialty cocktail concoctions to enjoying beer and live music at a pub. If you are planning a classic California road trip, below is a map of the route from San Francisco to San Luis Obispo.